Simple to install for faster installations. Clamp together components can be taken apart and reused. Easy to connect to existing ductwork. Components and adapters to fit every system. Adjustable quick-fit fitting simplifies duct connections. Smooth interior surface helps prevent clogs. Designed to handle dust, chemicals, food, fumes and more, this system will cut your overall ducting and downtime costs. 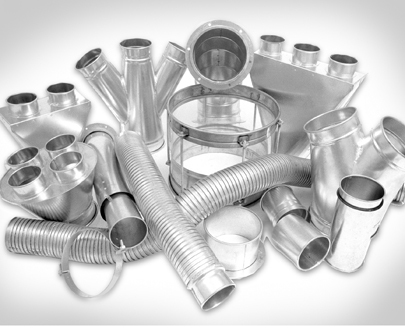 Piping and accessories are available in galvanized or stainless steel. Waller Sales associates will help you design your layout. Call for a free estimate and consultation concerning your ducting needs.